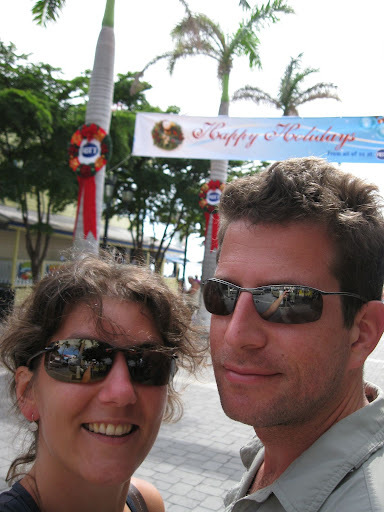 We went to St. Maarten to stay in my timeshare (~ahem~ OUR timeshare, since we're married and everything mine is ours). We had a direct flight and let me tell you, I'm never NOT doing direct again! Totally worth it. The trip was a flurry of drinking, sun, swimming, eating, shopping, reading, writing and dancing. Possibly in that order. We met lots of new people and connected with old friends. The resort is fabulous and we spent a lot more time on it this time, since we've pretty much already explored the island. We did go to Pinel Island this time, though, and it was gorgeous! I bought new amazing sunglasses and a pair of earrings, as well as the other usual gifts and trinket jewelry. One week was not enough time to really feel relaxed. But I think it'll be our last time there for a while. I want to go on a big, long trip in 2011 and that means skipping our island paradise. So if you want to stay in our resort in St. Maarten, let me know. Finally, my brother visited from Calgary. That was super fun as we played Star Trek Monopoly and then woke up to coffee and breakfast made by Gordon while we worked side by side at the dining room table. Gordon and I exchanged our presents. I'd already received my bike panniers and opened up a SmartPen which looks like it'll be fun to try out. I got Gordon clothes, gloves and a sailing class. We then met my sister at the airport and drove back to my parents' house where the rest of the family was waiting. By then, I was sick. It didn't get any better. I sat by the fire, as I love to do. I coughed and slept and hung out. But I didn't even eat crappy food. And by "crappy" I mean all the baking I brought home with me. And chocolates. I just didn't have the appetite. Ya, seriously. I couldn't even eat Christmas baking! It was still nice to be home with the family. We opened Christmas presents and I got lots of awesome stuff: the perfect purse, a composter, gift cards for La Senza and WaySpa.com and a great haircut. Oh and money for boxing day sales. I read my magazine by the fire. We watched Benjamin Button. Boxing Day we shopped. I bought a pair of fantastic boots on sale. They're perfect. I was still feeling super crappy. Feverish. We went on to Guelph that night to hang with the family there. The rest of them went to visit my Grandma, aunt and uncle. I stayed home, feeling super sick and sorry for myself. To be honest, though, I had a wonderful day watching TV and movies with my dad. I drove my brother back to the bus station in Toronto, barely making it there on time. Thankfully, the bus was a few minutes late. And I continued on home to unpack. At least I got to see my husband for the first time of the holidays. We met up at home and made plans to get together later at his brother's house. See, Gordon's cat got very sick over the holidays. They took him to the vet who went to town and spent lots of money on his recovery. So now Skippy is a very expensive functional cat who takes two grown men to give him his pills four times a day. Which means that Gordon is staying at his brother Darren's house. Off to Sleep Country to exchange our mattress, which we bought with our wedding money but then both found too hard. This second mattress had better work as there are no returns on this one. I picked out a sweet mattress, though -- just hope Gordon likes it too. He said he trusted me to pick it. After swinging by the grocery store to pick up dinner, we ate at Darren's house and watched a movie: The American. A decent movie. I drove home to sleep in my own bed with a migraine and the flu still lurking. Yesterday I awoke to still more flu and migraine. Took medication, but it seems that my migraine medication wasn't working. I met up with my mom and Kendra and the girls for lunch and a ballet matinee. (My sister couldn't make it as I'd infected her with the flu as well, it seems.) We shopped a bit (where I bought some stuff at Banana Republic that I probably don't need and should probably return) before the girls took off. Mom and I made our way back to my place and made dinner which the guys came over to share. They all went home - I decided to stay in Toronto to recover. This morning, I awoke feeling terrible. I took my alternate migraine medication and PRESTO! It worked! I feel a thousand times lighter! I had my tea and read my magazine before dragging out my laptop and getting started on this blog and then realizing that my site was in BAD need of an update. So I took care of that too. Suddenly it's evening and I've eaten one banana, two turtles and two cups of tea. I did brush my teeth and get dressed, as the guys are promising to drop by and pick me up to make an indian dinner. I've accomplished exactly zero items on the to-do list for today. Although I did get halfway through cleaning the kitchen. And I added the website update and Facebook catch-up, so I can cross those off too. Is that everything that happened? No. We did many of our thank-you cards too. Yep, that's the exciting update. Kind of loses something when you don't have the introspective consideration of the minutiae of all the events of your life, don't you think?